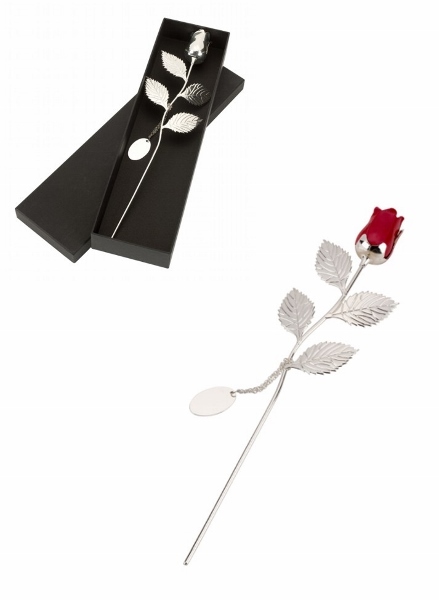 Personalised and Engraved Silver Plated Red Single Stemmed Rose with Gift Box. To personalise this gift we engrave the gift tag that is attached to the stem of the rose, these roses makes a truly unique gift. Complete with a Black Presentation box as shown. It measures 32cm in total. We can engrave both sides of the tag but please keep your text to a minimum. Ideally we can fit 3 lines of text with 3-4 words per line without it affecting the text size. A great present for an Anniversary, Special Birthday, Wedding, Mother's Day, Valentine's Day...it's endless!